We could all use an escape right now. Some time away from home, the news, and our social-media feeds would do us good. It’d be even better if we could step back in time. Not just a few weeks or months. Much further back. How does the Renaissance period sound? The Renaissance was the centuries that bridged the Middle Ages and modern history in Europe. It’s when walled cities with gates and towers were created. Castles, palaces, and cathedrals were built around town squares. Ornate stonework and coat of arms on houses lining cobbled streets showed off their owners’ wealth. Huge ships, which would sail to far away places, were constructed in the harbors. While the surrounding hillsides were full of vineyards, lavender fields, and pine forests. Trogir hasn’t changed much. The Croatian city is considered one of the best-preserved places in Europe. It was founded by the Greeks, became a major port for the Romans, and thrived under the control of the Venetians. 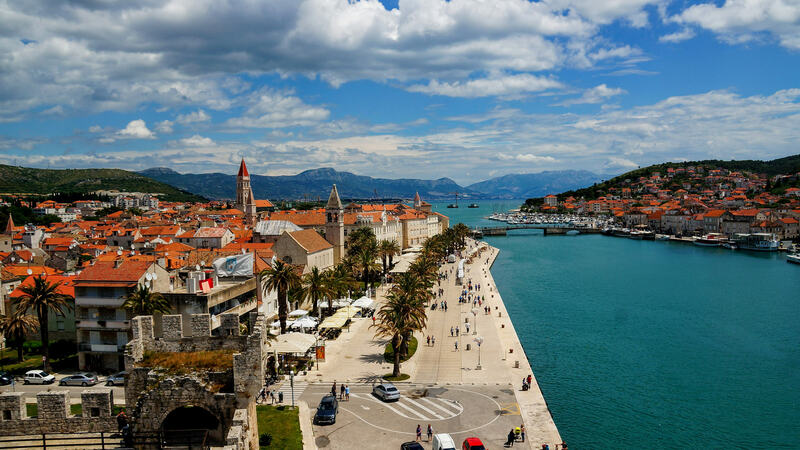 Trogir sits northwest of Split (Croatia’s second-largest city) and extends beyond the mainland to two islands now connected by bridges. The smallest island is the city’s historic center. A maze of narrow streets connect Kamerlengo Castle, the Duke’s Palace, and the Cathedral of St. Lawrence on it. The island of Čiovo, known for its beautiful beaches, is beyond that. It protected the city and the Kaštela gulf from invaders. Together the three parts of Trogir look like they’re straight out of a fairy tale. Most visitors spend an afternoon—not even a full day—in Trogir as part of a trip to Split. That’s not the way to do it. This is a place in which you need to slow down to really appreciate it. The Brown Beach House is the perfect place to help you do so. The new hotel, which took over an early-20th century tobacco-shipping station, lies on the north coast of Čiovo. Its waterfront location gives it both an uninterrupted view of Trogir’s historic center and easy access to the white-sand beaches nearby. Both are within walking distance. While the hotel itself feels chic and glamorous. Don’t worry, it isn’t stylish in a Renaissance sort of way. They went with a mid-century modern vibe instead. After being greeted with sparkling wine and a cool towel, you get your first glimpse of the huge living room. It’s full of modernist leather chairs, design books, and a billiard table. There’s a walled garden and a pool lined with black-and-white tiles outside. The terrace of Cartina, a seafood restaurant, spills outside, too. Then there’s the bedrooms. 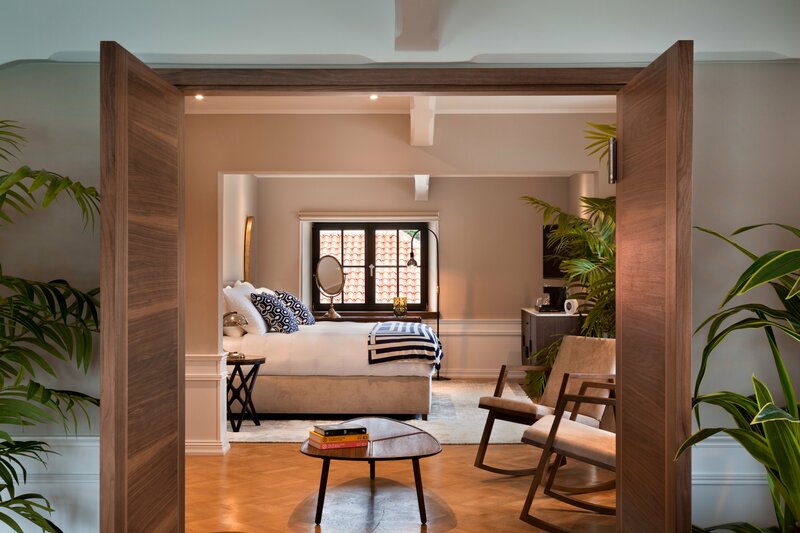 With Indonesian wood floors, banana-silk rugs, and green plants, they make you think about redecorating your apartment as soon as you return home. Now that you’re settled into your hotel, you can also settle into an easy routine. Mornings are reserved for exploring. You’ll visit the historic sites, walk along the marinas, and find hidden galleries and shops. When you stumble upon a courtyard shaded with grapevines, you’ll stop for olive oil, cheese, pršut (smoked ham), and a glass of wine. As the crowds grow, you’ll be happy that you already have an escape plan. That’s when you’ll head back to Čiovo to spend the afternoon at Okrug Gornji Beach or by the pool sipping a Cucumber Crush cocktail. Either way, you’ll have a gorgeous view and lots of sunshine. You’ve turned into quite the escape artist.